This week's Dynamic Duos Challenge is Mix and Match. Use Cherry Cobbler plus and one other colour. It seemed only fitting to create a Christmas Card so I chose PTI Simply Chartreuse as my other colour. 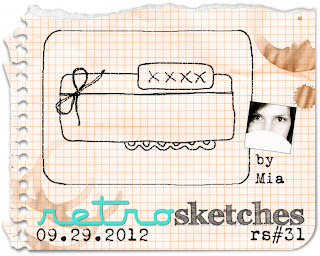 I used this week's RetroSketch for my inspiration. I inked up the Hero Arts Tiny Flakes Cling stamp with PTI Fresh Snow Ink and stamped a kraft card base. I don't know about you but I have always had trouble with stamping large stamped images. It seems that there is always part of it missing. Well squeal with delight, perfect the first time! No turn overs or do overs tonight. I cut my focal panel in Pure Poppy using a Spellbinders Long Scalloped Rectangle which I tied with bakers twine, tucked my sentiment behind it, added a clear embossed Christmas Tree and finished it off with some loopy border die. Am I in the Christmas spirit now? Maybe a bit, but this weekend is all about turkey and pumpkin pie. This is darling Tracey! I've always been partial to things made with kraft for Christmas. Large stamps are hard for me too, I try to avoid them LOL!!! I love your background stamping! The white ink on kraft if fabulous, love the loopy die border too! I love your clean simple look great Christmas card. I struggle with big stamps too! This is an awesome take on the sketch! Love that sweet little Christmas tree! I thought it was just me with the big stamps! This is a super cute card. I love the look of that long scalloped rectangle, and your whole card just says 'merry' to me. Cute Christmas tree stamp. love the loopy circles and your choice of colours. 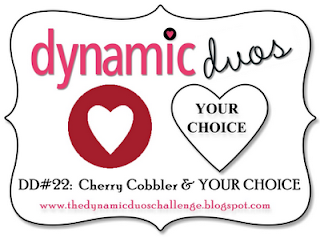 Thanks for joining us at Dynamic Duos this week Tracey. Your card is lovely. ;-) I love the white on kraft background, and that cute little tree with the twine behind. The loopy border is great! And you're not alone - I have to re-cut and turn over things ALL THE TIME. Kind of irritating sometimes - I wish I could get it right once and not have to spend the extra time that I really don't have. *head shaking* Anyway, your card is so sweet - I love it. ;-) Happy Thanksgiving next week! I hope it will be a fun time for you. What a sweet idea , Tracey! Not sure if I have trouble or not with large images. If its just the stamp and I leave it alone , I am fine. Fun card! Such a cute Christmas tree. Thanks for playing with us at Dynamic Duos! Hi Tracey! 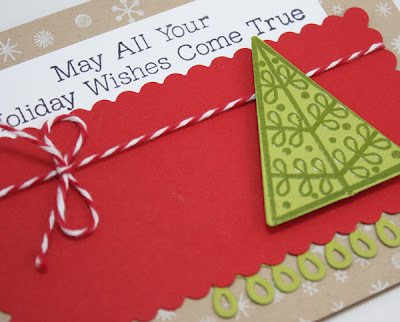 Pretty card - I love the clean lines and the traditional Christmas colors! I just realized you are not on my google reader...how did that happen?!!?!?! I fixed that today. Now I won't miss all of your gorgeous projects! Whoo hoo for stamping perfectly on the first try :) Love that tree, its so cute! Happy Thanksgiving! Wow, Tracey, your attention to details really show through in this one! Love the colors and intricate borders! I also like the kraft card stock you chose! Beautiful! This is lovely holiday card Tracey and a great take on the sketch. I loved your thanksgiving card too - so stylish. I hope you and your family have a great Thanksgiving weekend, and enjoy your turkey. pretty snowflake background! love this christmas card, Tracey! Adorable card Tracy - LOVE it! Thank you so much for playing with us at RetroSketches! Such a great card, Tracey! 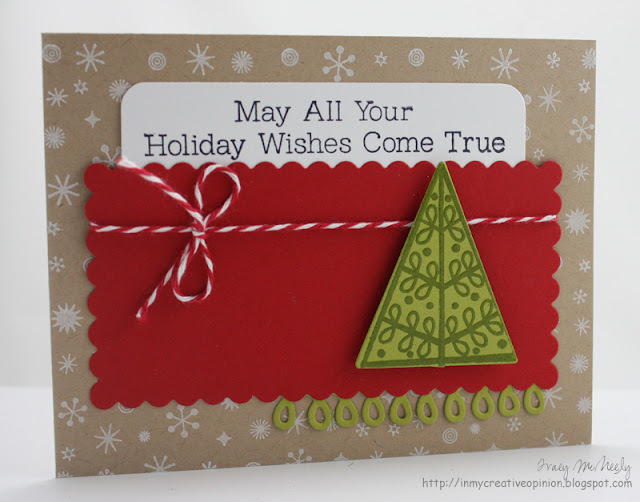 Love, love, LOVE the white snowflakes on your kraft background! And that little, sentiment pocket would be a great place to tuck a gift card! Hmmmm? Now, you've got me thinking ;). Thanks ever so much for the inspiration! Hugs! Tracey! This is perfect! I love how you used the loopy diecut and that scalloped rectangle! Congrats on your big win at Neat and Tangled!!! Great Christmas card ~ that is a fun tree in the Winterberry set ~ I am going to have use mine this season!